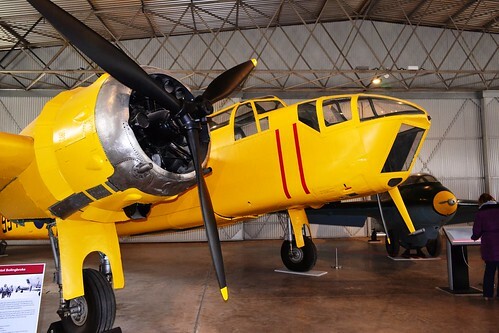 For Trail 43 we stay at East Fortune and take a closer look at Scotland’s National Museum of Flight, its aircraft, buildings and exhibits. 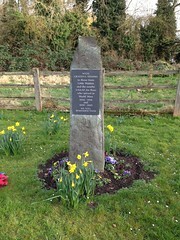 Located east of Edinburgh, not far from the main A1 road, between East Linton and Athelstaneford, East Fortune is an airfield with its roots set in the First World War. A former Airship station, it went on to house various training flights, and host a wide range of aircraft. Post war, it was adapted for possible U.S.A.F. use, then used to store food stuffs, and East Fortune stepped in to accommodate flights when Edinburgh’s Turnhouse airport was closed for maintenance and upgrading. Since 1975 it has housed one of the best collections of aircraft in the country (many from the former Strathallan collection) along with a number of well-preserved airfield buildings. This site is so historically important that it is now a Scheduled Monument, the terms of which are set out in the Ancient Monuments and Archaeological Areas Act 1979*1. Whilst not graded, East Fortune is, by definition, considered to be of national importance, and any such alterations or work done to it, has to have consent granted from Historic England who manages the process of scheduled monument consent on behalf of the Secretary of State. The National Museum of Flight has its aircraft stored in three hangars arranged by theme: civilian, military, and along with the Concorde Experience the Jet Age hangar. A fourth hangar is used for restoration and is closed to the public although tours can be arranged by appointment. The three main hangars are themselves historical pieces, each being a World War two Callender-Hamilton hangar. Originally designed in the late 1930s, by Callender Cable and Construction, they were initially designed with canvas doors, but later models, built in 1940, were constructed with metal doors. Whist being more secure, and no doubt warmer, they reduced the clear door height from 25 feet to 17 feet. The overall length of 185 feet and door openings of 90 feet remained the same however. These examples at East Fortune were recently restored, again by Smith Scott Mullan Associates, using funds in the region of £3.6m awarded mainly by the Scottish Government but also the National Heritage Lottery Fund. A number of the smaller technical buildings on the site were also targeted for restoration. After finding sagging roofs, penetrating damp, cracked or damaged rendering and distorted windows; five of the site’s buildings were earmarked for restoration and a five-year programme put in place to restore and preserve them, again keeping as close to the original designs as possible. These buildings are now in full-time use, used for exhibitions, artefact storage and as an education centre. In the first hangar, the Civilian Aviation Hangar, you can explore a range of civilian aircraft types, one notable model being the DH80 – de Havilland Puss Moth. A relatively unique aircraft, it was designed so that its wings could be folded back for easier storage. The undercarriage, an innovative feature in itself, could be turned through ninety degrees to act as air brakes thus allowing the pilot to land at a much steeper approach. Very popular, these models were often flown long distances with notable pilots including the long distance flyer Amy Johnson. Whilst primarily civilian, some models were used by the Royal Air Force, both 24 Squadron (Oct – Dec 1939) and 510 Squadron (delivered May 1941 on its formation). 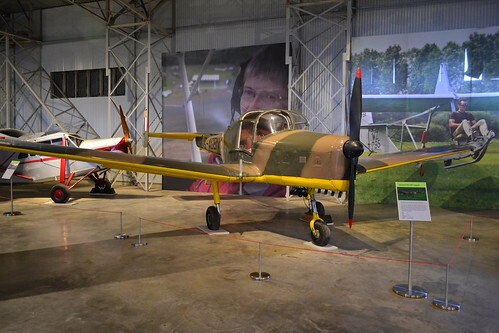 This particular model (ex G-ABDW) was the first Puss Moth to fly to Australia. The de Havilland Puss Moth VH-UQB (ex Strathallan G-ABDW), the first Puss Moth to fly to Australia. Another notable aircraft here at East Fortune is the Miles M18 MKII Prototype. Built as a private venture it was intended to replace the Miles Magister. During test flights it was noted that the aircraft could not be put into a spin by the pilot. However, sadly lacking in what the Air Ministry described as ‘robustness’, it was not put into full production and so only three models were ever built; the MKI, MKII and MKIII. The last remaining example here at East Fortune, G-AHKY, ‘HM545’, is the MKII and had a Certificate of Airworthiness up until September 1989, it was delivered to East Fortune four years later in 1993. It has a notable history in that it was sent to the Royal Navy on short loan, this may have been for service trials and was with 759 squadron in January 1941. In 1956 it won the Goodyear Trophy Air Race and in 1961, the Kings Cup Air Race reaching a speed of 142 mph. The three M18s operated with two engine types, the D.H. Gipsy Major engine (MKI) and the Blackburn Cirrus Major engine (MKII/III), giving a maximum speed of 142 mph and a ceiling height of 12,800 feet. It had a cruising speed of 130 mph. This particular example remains the only one left in existence. The Miles M18 MKII Prototype, the only remaining example of its type. Also at East Fortune is a General Aircraft Cygnet. Designed in 1936, it was first flown in May 1937, and was at that time, the first all-metal stressed-skin light plane to be both constructed and flown in the U.K. This particular model, was a later modified model having a nose wheel as opposed to a tail wheel and designated the GAL.42 Cygnet II. After the initial prototype, only ten production models were ever built with five going to the Royal Air Force (24 and 510 Squadron, 51 and 52 O.T.U.). This and one other (reported to be in very poor condition in Argentina) are the only surviving examples in the world. G-AGBN is currently exhibited in military colours, an ex Strathallan example, it served as ES915 with both 51 and 52 O.T.U. preparing pilots for the Boston, another tricycle carriage aircraft of the Second World War. It is also reported that the Cygnet was flown by Guy Gibson, adding further historical interest to this model. The General Aircraft L.42 Cygnet II – adapted as a trainer for pilots of RAF Boston aircraft. 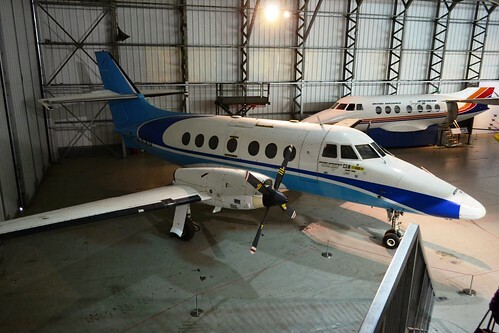 Other civilian examples found here include: an Avro Anson in part construction form, a de Havilland Dove 6, G-ANOV (ex SAFU Stansted), a Jetstream 3100 (G-JSSD) and a BAC 111-510ED located outside the hangar. The civilian hangar at East Fortune holds many rare and interesting examples from aviation’s history. Each one worthy of saving and viewing. In the next part, we look into the military examples at East Fortune, with aircraft ranging from the Second World War through the Cold war to the modern fighters of the Royal Air Force. In the second part of this visit we look into the current display of military aircraft at East Fortune. A collection that ranges from the Second World War through to the end of the Cold War, it is a glimpse into the history and development of fighter aircraft over the last half of the 1900s. Early examples include the Bristol Bolingbroke IV-T, the Canadian built Blenheim that was used to train air gunners, navigators and bomb aimers. The Bristol Bolingbroke, an ex Strathallan collection model that served with the R.C.A.F. The Bolingbroke had a crew of three, with a top speed of 266 mph. It was initially a Blenheim MKI (designated Bristol Type 142M) and was first flown at Filton on 24th September 1937. 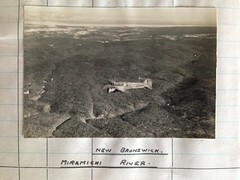 Morphing into the Blenheim, the Bolingbroke soon passed into obscurity, however, it did catch the eye of the Canadian Government, who applied to build it under licence at the Fairchild Aircraft Company in Quebec. The original prototype model was sent to Canada and used as a pattern for subsequent designs, the first model entering Royal Canadian Air Force (R.C.A.F.) service in November 1939. For the first few years, Bolingbrokes were used in the anti-submarine role, initially along the eastern coast of Canada and then later on, after the Japanese attack on Pearl Harbour, along the western coast . The Canadians made a number of changes to the original design, installing U.S. dials and instruments in a modified cockpit for one, and also making room to store a dingy should the aircraft come down in the icy waters around Canada. Then as part of the agreement made between the Canadians and British for Canada to supply trained crews as part of their support for the war effort, Bolingbrokes were used as training aircraft, and so were supplied to various Gunnery and Flying Training Schools across Canada. This particular example ‘9940’, is painted in a yellow colour scheme, it flew as part of this British Commonwealth Air Training Plan. It is an ex Strathallan collection aircraft previously used by the R.C.A.F. No. 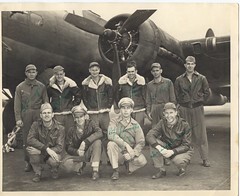 5 Bomber and Gunnery School, Dafoe, Saskatchewan in Canada. 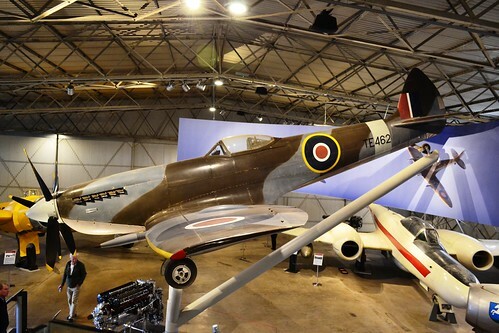 Another wartime example in the military hangar is the Supermarine Spitfire LF.XVIe. Built in July 1945, TE462 never saw active war service, instead flew with one of the five Flying Refresher Schools to retrain pilots after the Second World War. 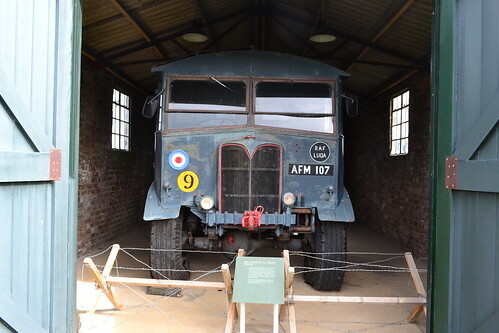 Post service, it was used as a gate guard at RAF Ouston, Northumberland, in a time when the R.A.F. flew D.H. Vampires from the airfield. In 1968 TE462 was removed from Oulton to be used in the highly acclaimed film the ‘Battle of Britain’. Being a much later model to those classic 1940 examples, extensive modifications would have been needed if it were to appear in any flying roles on camera. 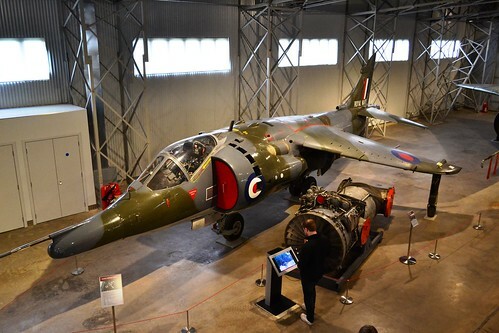 In 1971, TE462 was donated by the Ministry of Defence to the now National Museum of Scotland, who were then, due to lack of space in Edinburgh, allowed to use one of the hangars at East Fortune for her storage. It was this move that helped generate the ideas and movements that created the museum as it is today. Spitfire ‘TE462’ stands proudly as the centre piece of the military exhibition. Spitfire LF.XVIe ‘TE462’ now stands on a plinth as the centre piece of the East Fortune Military Hangar. 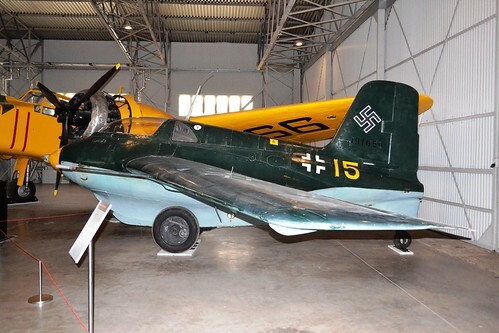 Another Second World War Example is the German Messerschmitt Komet Me 163B-1a. 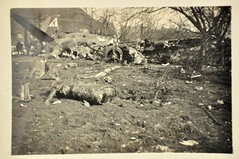 Another 1945 example, this model (s/n 191659) is unique in that it was flown by R.A.F. pilot Captain Eric ‘Winkle’ Brown. The Komet, built by various manufactures using slave labour, was the only rocket-powered aircraft ever to enter combat. A very dangerous aircraft to fly because of its mixture of explosive fuels, Brown described its handling to 32,000 ft as “Fantastic!”. Post war and Cold War examples make up for most of the exhibits in this hangar at East Fortune. The nose section of Canberra B.8 reported to be VX185, is an ex Wroughton exhibit, the original of which flew a return flight to Canada in 10 hours 3 minutes and 29.28 seconds, setting a new transatlantic record at that time. The Canberra being a revolution in aircraft design in the early post war era, was used to fly long-range reconnaissance missions and proved its worth for many years to come. WF259 Hawker Sea Hawk of the Royal Navy. 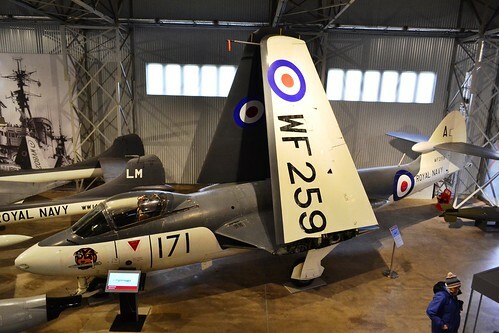 Two Royal Navy aircraft examples are found in this hangar, the Hawker Sea Hawk and the D.H. Sea Venom. The Sea Hawk ‘WF259’ (171) is an F.2 model and a Lossiemouth veteran. Designed around a Rolls-Royce Nene 101 and latterly 103 engine, they were single seat fighters that first flew as a prototype on 2nd September 1947. Whilst not seen as a major step forward from the RAF’s Vampires and Meteors, it was successful with the Navy, proving its worth in the ground attack role. The Sea Hawk, a thoroughbred from the Sir Sydney Camm stables, formed the backbone of the Fleet Air Arm during the 1950s and was exported to various European countries and India, where many still survive as museum pieces today. The D.H. Sea Venom, an FAW.22, WW145 ‘680’, is also an ex Lossiemouth veteran. Serving with both 891 and 750 Naval Air Squadrons of the Fleet Air Arm. It was a naval development of the RAF’s 2-seater Venom NF3 Night Fighter, with numerous modifications to enable it to operate from carrier decks. The D.H. Sea Venom operated with both 891 and 750 Naval Air Squadrons of the Fleet Air Arm. A Meteor NF.14 of The Ferranti Flying Unit based at Edinburgh’s Turnhouse Airport, is painted in white and red giving it a distinctive paint scheme. The unit was set up in 1949 to test distance measuring equipment for the Ferranti group whilst based at the airport. Between its inception and disbandment in 1973, it flew twenty-five different models of aircraft, the long-nosed NF.14 being just one of them. Czechoslovakian marked Aero S-103. A Mig 15 built under licence. International Cold War aircraft are represented with the Czechoslovakian marked Aero S-103. 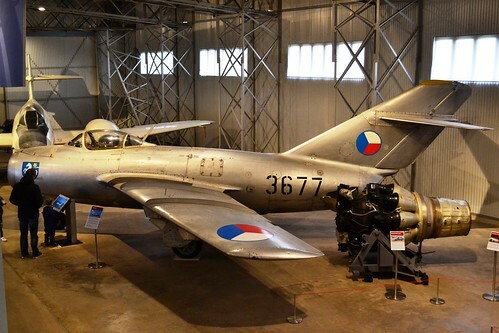 A Soviet MiG-15bis, it was built under licence by the Aero Vodochody aircraft company in 1956. The Mig proved itself as a very potent fighter during the Korean War, attacking U.S. bombers from beyond their defensive gun range. Whilst it did have its flying limitations, it was quickly realised as a close match for the American F-86 Sabres. This particular model, ‘3677’ is an ex Caslav, Ostravian Air Regt. c/n 613677 of the Czechoslovakian Air Force, the badge just visible on the nose is that of the City of Ostrava. Moving toward more modern eras, we see the E.E. Lightning, SEPECAT Jaguar, Hawker Siddeley Harrier, and the Panavia Tornado. XN776 served with 92 Squadron. The Lightning, F.2A ‘XN776’, built by English Electric (B.A.C./B.A.) served with 92 Squadron, and was the only Mach 2 all British aircraft to serve with the R.A.F. 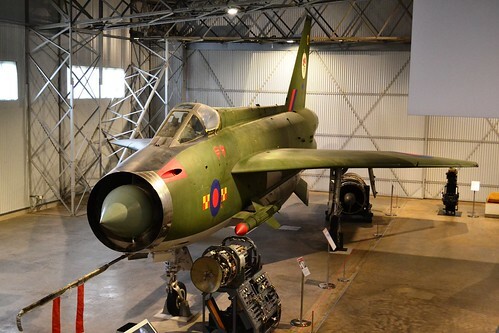 Lightning XN776 first flew (as an F.2) on 18th October 1962 subsequently being delivered to 19 Squadron. After seven years, she was returned to Warton for conversion work to upgrade her to an F.2A model, and then delivered to 19 squadron at Gutersloh a few months later. Her last operational flight was on 3rd March 1977, being flown to Leuchars on April 5th that year. She displays on her tail, the blue diamonds that represent the Blue Diamond Aerobatic team that previously used Hunters with 92 Squadron. With a maximum speed of 1,500 mph (Mach 2.3) and a service ceiling in excess of 60,000 ft, she was a potent and deadly weapon restricted only by her high usage of fuel. The Harrier, a GR.1, is the reputed to be the oldest surviving Harrier example, a unique design it is famous for its Vertical or Short Take-Off and Landing (V/STOL) capabilities, now taken on by the F.35 Lightning. This particular model (XV277) was only used for test purposes and never saw operational service. During its life it has taken on many changes and modifications, but it still remains the much-loved Harrier. The remaining aircraft here, the Jaguar and Tornado, did however see operational service. 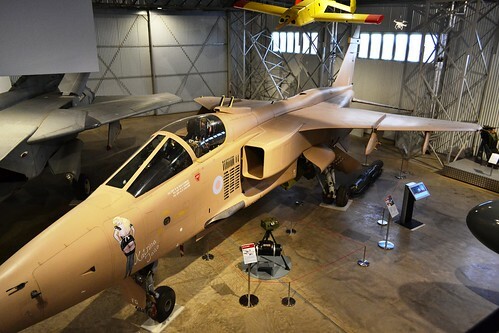 The Jaguar ‘XZ119’ (with nose art Katrina Jane), flew 40 operational sorties during the first Gulf War in 1990 / 1991, her nose-art bomb-tally testament to her successes; whilst the Tornado ‘ZE934’ also flew during the first Gulf War, performing air defence patrols from Saudi Arabia. Other than this it operated primarily at RAF Leuchars in Fife with 111 squadron. Jaguar GR.1A ‘XZ119’ carried out 40 successful bombing missions during the first Gulf War. Outside the military hangar is Vulcan B.2 XM597, the mighty ‘V’ bomber designed as Britain’s nuclear deterrent until the role was taken on by the Royal Navy in 1969. XM597, an ex Waddington aircraft, entered service with 12 squadron on the 27th of August 1963, going on to serve with 35, 50, 9, and 101 squadrons. She also saw service in the Falklands in three of the Black Buck missions. 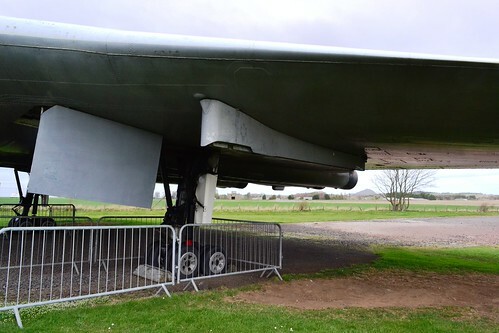 XM597 was different to other Vulcans in that she had wing pylons fitted. These carried up to four Shrike anti-radar missiles (previously for Skybolt) and were used during these missions. Her first mission, Black Buck 4, was cancelled due to a faulty refuelling drogue on a Victor tanker. On the Black Buck 5 mission, on 31st May 1982, the Vulcan took off once again, over the target she fired two missiles causing some minor damage to an Argentinian Radar installation. On mission six, XM597 returned to the Falklands again armed with more Shrike anti-radar missiles. 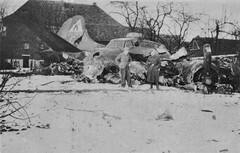 Two missiles were launched and the enemy ground-based radar was destroyed. On the return leg of the mission though, a planned rendezvous with a Victor tanker went wrong when the refuelling probe on the Vulcan became damaged. With too little fuel to get home to Ascension Island, the Pilot, Squadron Leader Neil McDougall, diverted to the only airfield he could possibly reach before running out of fuel. Climbing high and jettisoning the remaining two weapons (one failed to release and remained on the pylon), he carefully nursed the Vulcan to Rio de Janeiro where he landed safely and where the aircraft, her crew, and the remaining missile were impounded for nine days before being released. 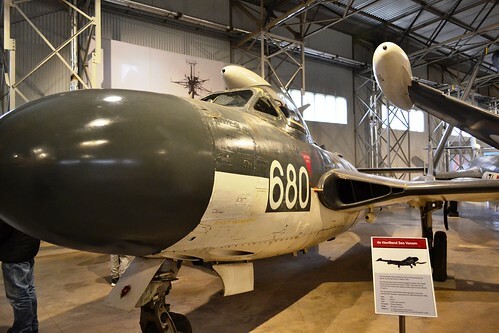 One of the conditions of the release however, was that XM597 took no further part in the conflict with Argentina and that the rogue missile stayed in Brazil. 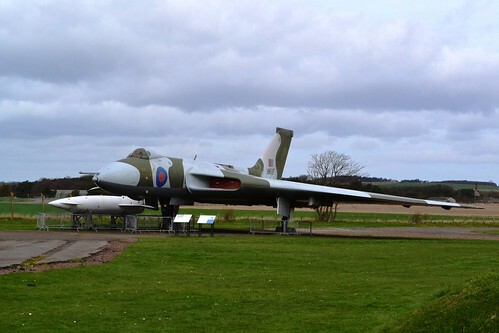 XM597 later retired to the East Fortune collection in 1984, with her two missile strikes painted on her nose*3. The under wing pylons that carried the Shrike Anti Radar missiles. The military collection at East Fortune is, like the civil collection, filled with unique and historically important aircraft. A range that stems from the Second World War through the Cold War and on to modern conflicts and models, it is a dynamic collection of aircraft that just cannot fail to impress. The final public hangar at East Fortune holds what is perhaps its pièce de résistance, an aircraft so ahead of its time that it has never been successfully matched. 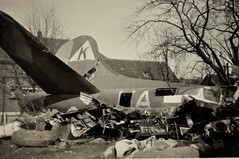 An aircraft that became simply too expensive to operate but was withdrawn under a cloak of darkness and sadness. In the third public hangar is the story of the Jet Age, a story that tells of the development of the modern jet air liner, from the post war development through to the classics of today. A story that is set around the beautiful aircraft that is of course the B.A.C. Concorde. 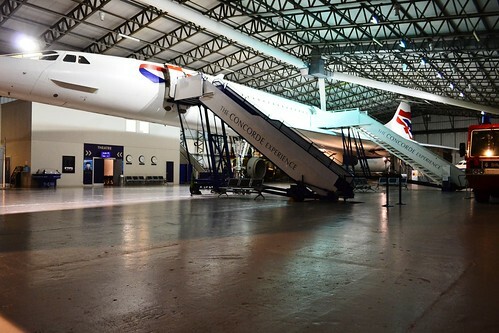 The Concorde at the National Museum of Flight (G-BOAA) was the first model Concorde to go into active service in 1976. After flying for a total of 22,768 hours and 56 minutes, in almost 25 years of service, she finally came to rest after what was possibly the most ambitious transportation project ever undertaken. In all her flying time she has visited cities right across the world including: New York, Paris, Bahrain, Miami, Calcutta, Auckland and Barbados. In her life time, G-BOAA has landed over 8,000 times and has flown through almost 7,000 supersonic cycles. She has become an icon, a reflection of what is achievable in civil aviation development. Concorde was designed and built in agreement between the French Sud Aviation (later Aérospatiale) and Britain’s British Aircraft Corporation (later B.A.E.). Each would make their own prototype, the French (001) flying first on 2nd March 1969, with the British model (002) flying from Fliton a month later on April 9th 1969. At the Paris airshow prospects looked good and over the next few years 65 initial orders were placed by 17 countries with options for many more. However, growing concerns over manufacturing costs, noise, environmental pollution and running costs eventually reduced the orders to just a handful from both British Airways and Air France. With the price of a return ticket London to New York in excess of £6,500 in 2003, it certainly wasn’t cheap, nor affordable for the average man in the street (but where else can you watch the Mach Meter climb through Mach 2). It was however, a head turner. Wherever Concorde flew crowds gathered to watch in awe of her grace and technological advancement. Concorde G-BOAA stands proudly as the centre piece of the Concorde Experience. Sadly, on July 25th 2000, it all went terribly wrong when taking off from Charles de Gaulle airport, Concorde F-BTSC ran over a small piece of debris causing the tyre to burst sending shards of rubber at high-speed into the wing of the aircraft. An internal fuel tank ruptured and high-octane fuel poured from the wing igniting as it left. 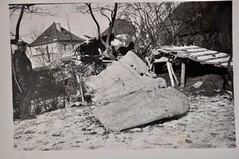 With too little runway to land and insufficient power to fly, it couldn’t fail to miss the Hôtelissimo Les Relais Bleus Hotel and crashed. 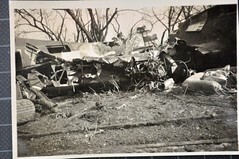 A terrible tragedy that began the rapid rundown and retirement of the entire Concorde fleet. Following a slump in air travel due to terrorist activities, rising costs of Concorde and the urgent need for upgrades, by 2003 all Concordes had ceased flying, and the disposal of the air-frames began. G-BOAA was delivered to East Fortune following a major operation that involved taking it by road to the River Thames, along the Thames by specialist barge and out to sea, around the coast of England and Scotland, and then by road to East Fortune. Roads had to be purposely made cutting through a number of fields in order to get the aircraft to its new home. An operation that took over a week was supported by members of 39 Engineer Regiment’s 53 Field Squadron (Air Support) with a helicopter assistance. Today Concorde G-BOAA stands as the centre piece of the Jet Age and Concorde Experience Hangar, a proud and open monument to the collaboration and development of the Supersonic passenger age. But this hangar is not just about Concorde. A cockpit and front cabin portion from a Boeing 707-436 (G-APFJ), and Hawker Siddeley Trident 1C (G-ARPH) cockpit, gives the visitor another insight into life inside another 1960s long haul passenger jet. Outside another two classic passenger aircraft, de Havilland’s Comet 4C (G-BDIX) and the BAC 111-510ED (G-AVMO) further give the visitor an insight into these classic times. 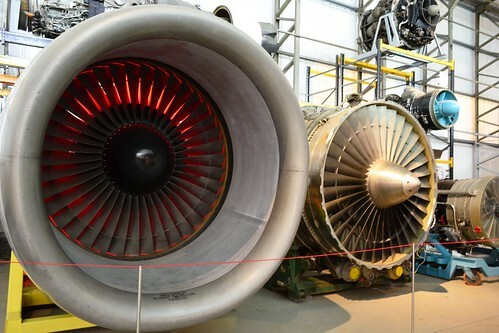 A range of jet engines allow you to compare sizes and features, and stories from those who were involved in flying these masters of the sky bring the ‘Golden age of air travel’ to life once more. Some of the engines on view at East Fortune. The remainder of the museum is displays and hands on activities. 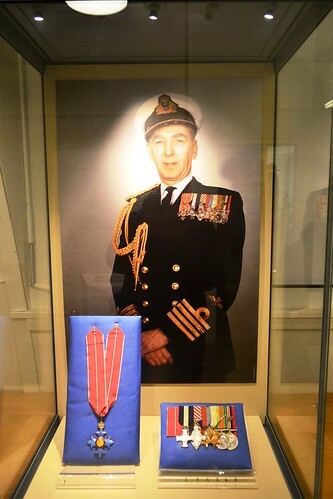 The history of East Fortune, is well portrayed as are the medals of Captain Eric Melrose “Winkle” Brown, CBE, DSC, AFC, Hon FRAeS, RN., and the flying jacket and personal artefacts of Rolf Niehoff, the navigator of the Humbie Heinkel. 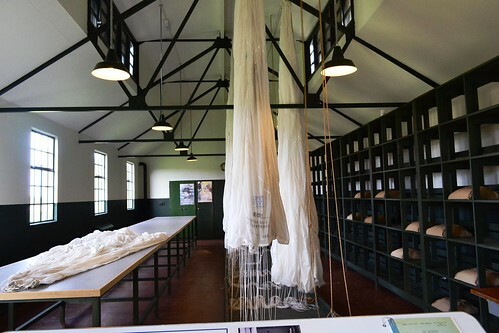 As mentioned earlier, the parachute store has been fully refurbished and is displayed in the way it would have been used during the war years. A unique building, they are easily recognisable by their higher central roof section, or as in some models, offset sloping roofs. Designed to hang and dry parachutes, they are kept at a constant temperature, ideally between 550F and 650F. Wartime parachute stores were built with 4.5 inch thick walls, early designs having a symmetrical two-stage pitched roof as is here at East Fortune. The parachutes were hung from the highest point on a pulley system, so that the silk was kept away from the floor and allowed to dry evenly and cleanly. Once dry, they were lowered to a packing table, inspected, packed away and stored in the store on racks. Each pack was labelled with an inspection date and the person to whom it belonged – each crewman having earlier being measured for his own parachute. This is possibly the only original parachute store remaining in this condition in the UK and shows the method of drying, packing and storing these vital pieces of equipment extremely well. The inside of the parachute store clearly shows how they parachutes were dried, packed and stored. Other exhibits include the RAF’s Matador lorry and a ‘Green Goddess’ fire engine. Made more famous perhaps by the firemen’s strikes of 2002, they were built in the 1950s, and were designed to be used in the event of a nuclear attack. Operated by civilian personnel of the Auxiliary Fire Service (AFS) they would be rushed into cities to extinguish fires and repair water systems. Thankfully, they were never used in this particular role. The range of exhibits at East Fortune is fabulous. 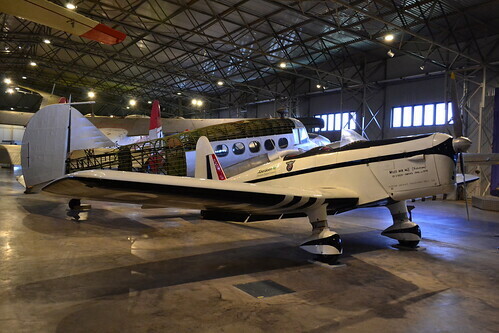 The history of aviation, both civil and military is shown through a range of rare examples, that are restored and maintained in original buildings, purposely restored in line with their original designs and construction. For anyone wanting to see original airfield buildings and beautifully restored aircraft, it is certainly worthy of a trip and is time very well spent. *3 Royal Air Force Website – Operation ‘Black Buck’. 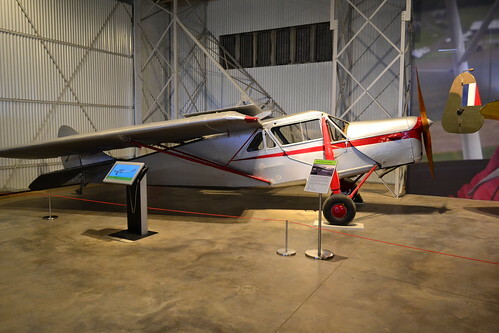 The National Museum of Flight Website has details of tickets, events and features on the various exhibits there. A list of the aircraft locations at East Fortune.